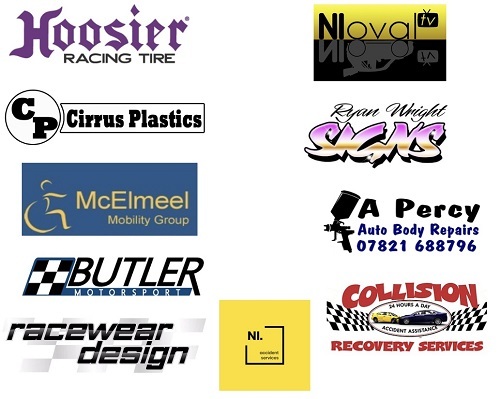 Packed Easter Programme at DMC Race Promotions! 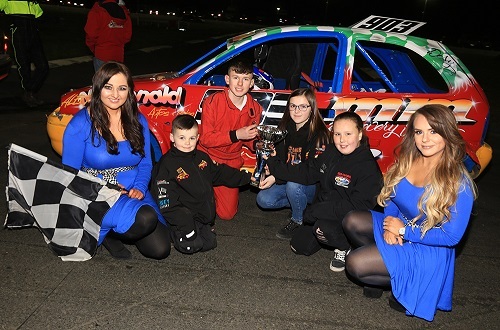 DMC Race Promotions in association with Spedeworth Motorsports have a fantastic Easter weekend of racing lined up, with action at Tullyroan Oval on Easter Saturday night (6pm) and then Aghadowey Oval on Easter Monday afternoon (1pm). 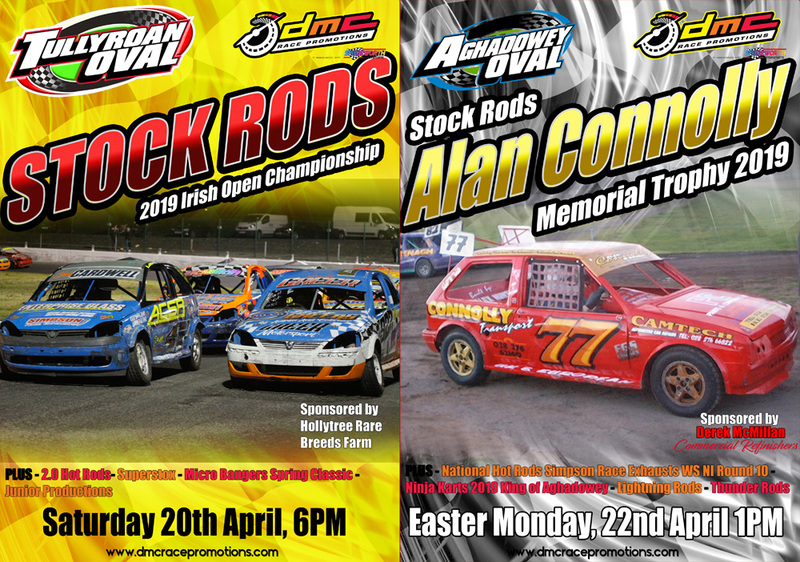 The Stock Rods take centre stage on both days of action, with the Irish Open Championship up for grabs on Saturday night before the oval racing world will gather at Aghadowey Oval on Easter Monday afternoon to pay tribute to Ballymoney's three times World Champion Alan Connolly. 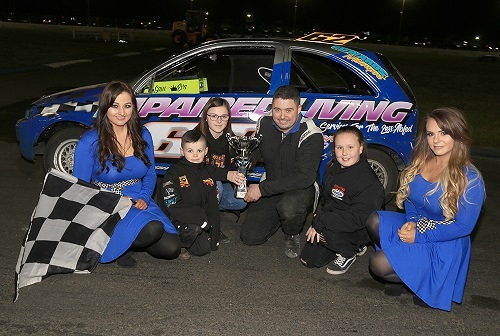 The hugely anticipated event will see a huge field of Stock Rod racers from all over the British Isles converge on the circuit for the inaugural running of The Alan Connolly Memorial Trophy, following Alan's untimely death a year ago after a long battle with illness. 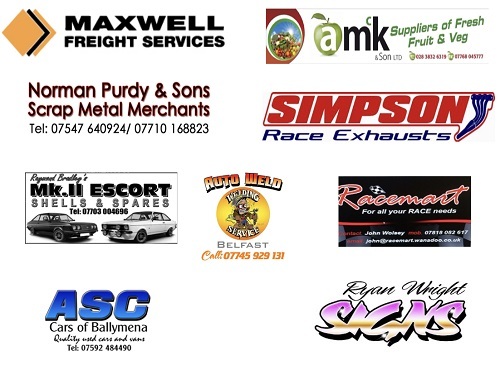 With a huge prize fund up for grabs it will be the richest short oval race meeting ever staged in Ulster. An unprecedented entry of over 50 Stock Rods have booked in to appear across the weekend, led by current World Champion Eric Walker from Surrey. Five times World title holder Chris Lattka from Scotland was a long time sparring partner of Connolly's and a former Irish Open Champion too, and he is also making the trip from his Falkirk base for the coveted showdowns. 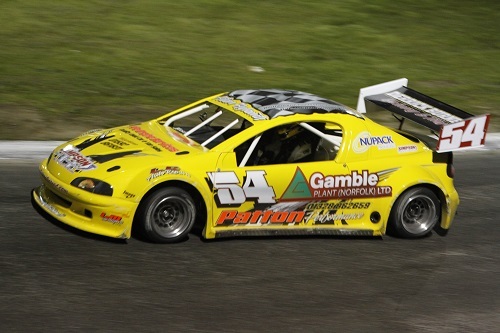 The action is sure to come thick and fast, with wheel to wheel racing guaranteed throughout the weekend. Former World Champion and current Irish Open Champion Stevie McNiece and former Irish Champion Victor McAfee are two more who raced with Connolly in years gone by, and both will harbour hopes of a big win. Staffordshire's Dave Leech is returning to the formula to race in this meeting, as is former World Champion and these days National Hot Rod star Glenn Bell from Portadown. Current National Champion Curtis Greer from Ballymena, Kells' British Champion Shane McMillan and his brother Derek, Glenavy's Jonny Cardwell, Dublin's Gary Butler and Ballymena's Micky McFall will be other local hopefuls in both events. Scottish star Siobhan Martin, Tipperary's Alan McCormack and England's Matt Woodcock, Daniel Rea, James Morris, Darren Cardy and Maison Waugh will be others keen to grab some good finishes. Saturday’s action at Tullyroan Oval will also see the Micro Bangers in action for the Spring Classic, where the action and carnage should come thick and fast. The evening will finish with the last car standing Destruction Derby! 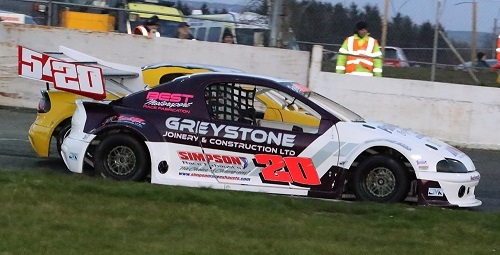 Scottish ace Bryan Forrest will join the local regulars, led by World Champion Lee Davison, on the Supeerstox grid, whilst the 2.0 Hot Rods and Junior Productions complete the line up. The first race of the Hollytree Rare Breeds Farm sponsored meeting leaves the Tullyroan grid at 6pm. On Easter Monday at Aghadowey the National Hot Rods will also be in action, with the fastest cars on the local ovals providing close, competitive racing. 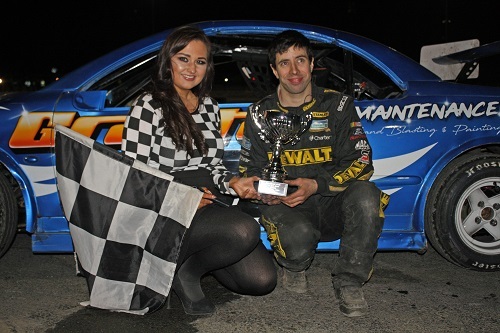 Dungannon's Derek Martin broke the track record on his way to victory at Aghadowey last month, and he will start amongst the favourites in Round 10 of the Simpson Race Exhausts World Series NI. British Champion Adam Hylands is bang on form too having won the Scottish Open Championship just a fortnight ago, whilst Glenn Bell, John Christie, Carl Sloan and Shane Murray are other possible contenders for glory. Hoosier Tyres have kindly donated a brand new slick tyre for the final winner in memory of Alan Connolly, who of course was a National Hot Rod racer at the end of his distinguished career. 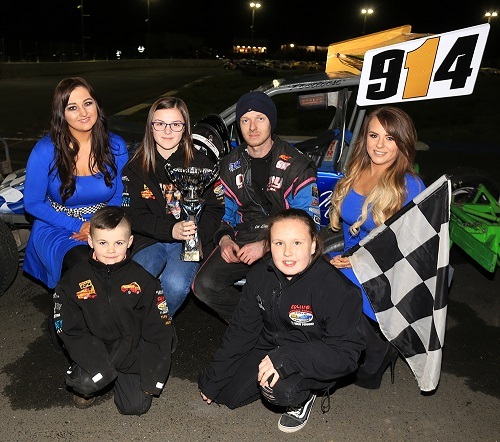 Also in action will be the young stars in the Ninja Karts contesting their King of Aghadowey title, which will be defended by recently crowned National Champion Bailey Millar from Lanarkshire in Scotland. A large contingent of young Scottish stars will be making the trip to race with the local aces. The all action Lightning Rods and Thunder Rods complete the holiday programme. The first race at the special memorial meeting, sponsored by Derek McMillan Commercial Refinishers, blasts off the grid at 1pm. Dream Debut For Martin's New Charger! 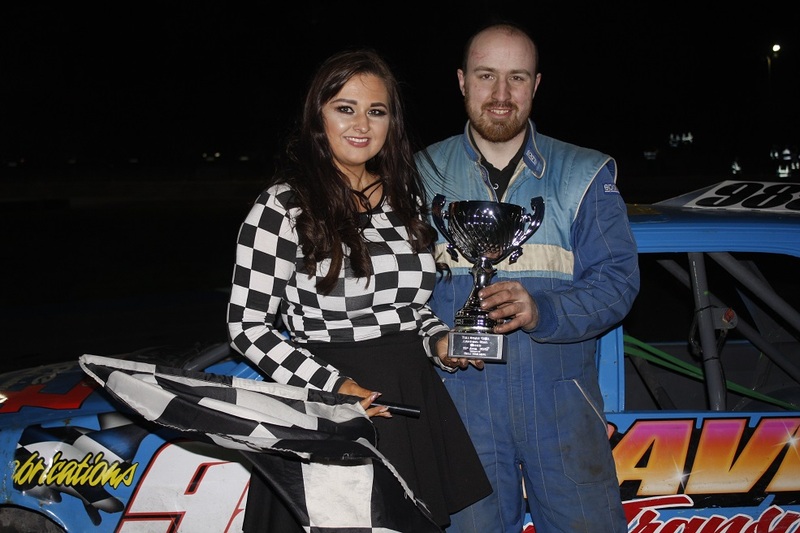 The 2019 Aghadowey Oval race season kicked off in style on Saturday evening, with a packed programme of entertaining race action. Dungannon’s Derek Martin took a polished heat and final double in the eighth round of the Simpson Race Exhausts National Hot Rods World Series NI to christen his new car in style, while English based outfit Team TMT won the 2L National Bangers Irish Teams Championship after a bruising affair. The well subscribed Stock Rods division saw Mick Rodgers from Randalstown take the victory despite some huge pressure from a chasing pack, whilst the other victories at the Collision Accident Management Services sponsored meeting fell to World Champion Lee Davison in the Superstox and Irish Champion Adam McFall in the Junior Productions. New National Hot Rods from British Champion Adam Hylands and Derek Martin created plenty of interest in the pit area, on a night when conditions were absolutely perfect on track. The pace all evening was blistering, seeing the five-year-old lap record smashed a number of times. Simon Kennedy took a welcome victory in heat one over Andrew Stewart, with Keith Martin snatching third from a great battle that went right to the line. Gary Woolsey, Derek Martin and Glenn Bell followed them home, in a race in which Bell and then D Martin both lowered the lap record. Heat two saw D Martin blast through for a clear maiden win for his new charger, this time over Shane Murray and Stewart. Derek once again smashed the lap record, his time of 13.787 seconds lowering the benchmark held since the re-opening meeting in April 2014 by Mark Heatrick’s Mercedes. D Martin beat pole sitter Stewart away in the final and was never to be headed as he raced home to land the spoils in Simpson Race Exhausts World Series NI Round 8. Bell chased hard in second, only losing out to a mis-timed challenge by Hylands. As Martin romped home to the win, Murray inherited second after Hylands was docked two places, with Bell third having dropped back late on with brake trouble. 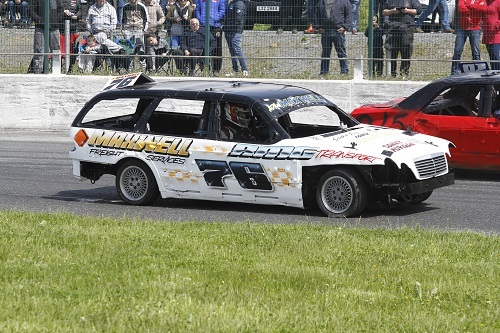 The Irish Teams Championship for the 2L National Bangers was a bruising affair right from the off, with Aaron Kelly taking a huge knock in heat one and Stephen Boyd also getting fenced hard. English ace Mark Marchant came through for the win ahead of James Steele and Domie Hall for a Team TMT lock out of the top places. Karl Smyth spun Hall not once but twice in heat two, but he himself was then taken out from the lead as his Bad Company team mate Leonard Dunn took up the running. Late on he was also wiped out by a rampant Marchant, which allowed Team Sour’s Adam Maxwell to take the win over Steele and Marchant. The action again came thick and fast in the final, with William McFaul out front until he was stopped in his tracks. Maxwell powered through to take his second win of the night ahead of Marchant and Hall. An entertaining Destruction Derby boiled down to a battle between Smyth and Rodney Herron, which finally went the way of Smyth after a couple of head-ons. Overall the Irish Teams title went to English visitors TMT by some margin, ahead of Team Sour A and Bad Company A. 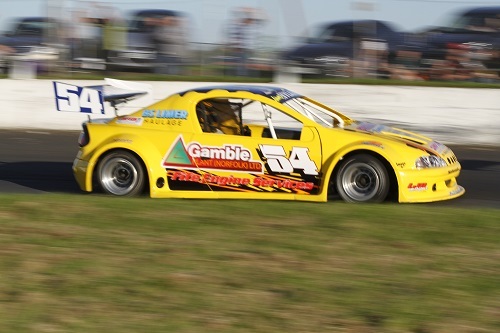 A packed field of Stock Rods once again produced some thrilling racing – they are the ‘must see’ formula on the local ovals at present. Novice grader Johnny McCloy raced clear in the opening heat, and despite a last lap challenge on the outside by Willie Taggart he held on for the win with Robert McIlroy in third. McCloy again led them off in heat two before losing out to Samuel Wilson, the young Larne ace racing clear to take the win, even after surviving a late caution period. Jordan McCann and Mick Rodgers filled out the places. Rodgers went ahead early in the final as the drivers once again produced fast and frenetic racing right down the field. Mick was having to withstand some huge pressure from behind, as Micky McFall and Wilson were right on his case for the full distance. Rodgers held his nerve though to take the win, with McFall, Wilson, Victor McAfee and Derek McMillan filling out the places. Former Stock Rodder Ed Davis led them away in the opening Superstox heat, with Brian Lammey chasing. Keith McAreavey, is his superbly presented car, came through late on to grab the win over Davis and World Champion Lee Davison. Davison was at the wheel of the borrowed Adam Lockhart car, and he used it to full potential in heat two. A timely last lap hit on long time leader Davis was enough to see Lee through for the win, with Chris McArdle in third. 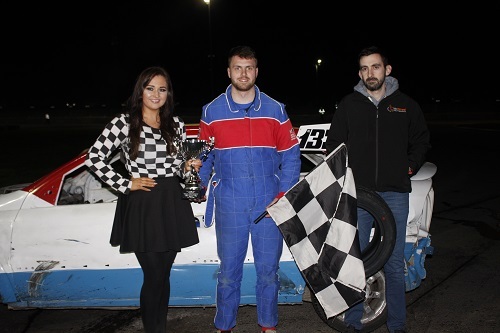 Davison was on a charge in the final too, going ahead to grab his second victory of the night, once again ahead of Davis and McArdle, with Sean Mark and McAreavey next up. Alex Milligan and Jordan Nicholl were welcome debutants in the Junior Productions field, with James Stewart setting the pace in heat one. He kept them all at bay to take the win over a squabbling Adam McFall and Graham Meek. Stewart again led the way in heat two before Sam McNeice found a way past to take the flag. He was unfortunately demoted for jumping the start though, handing the win to Meek ahead of Stewart. Jack Morrow was on a charge in the final, swooping past Stewart to go ahead before mechanical gremlins cruelly forced him out. 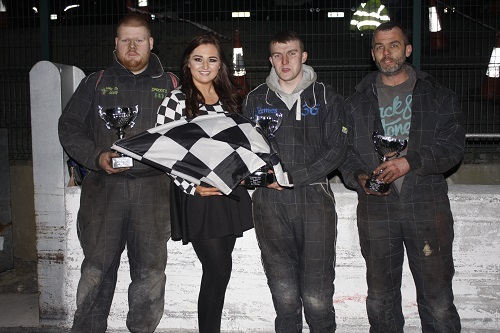 That handed the lead to McFall, and the Irish Champion raced home to take the silverware over McNeice and Stewart.